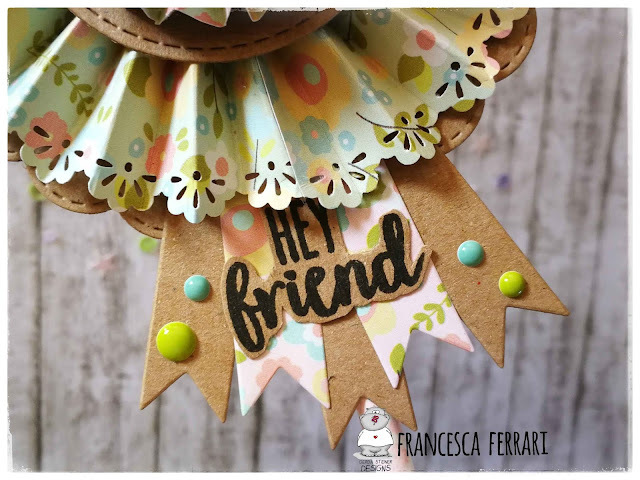 Hi, crafty friends! 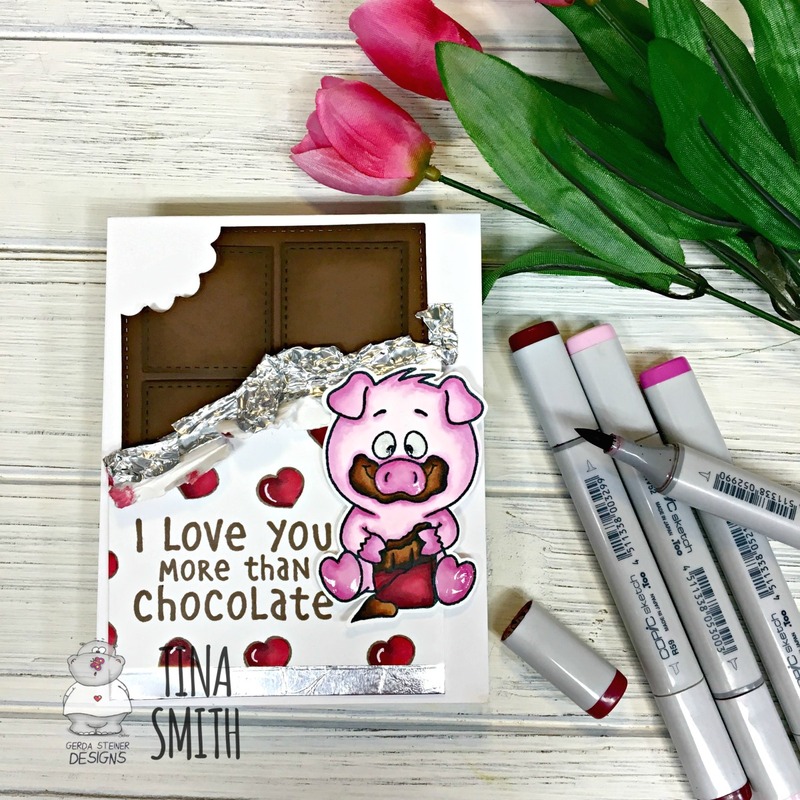 Its Rebekah here with you this evening bringing you this fun Valentine's Day card using the 'More then Chocolate ' stamp set! How adorable is this little piggie. I can totally identify! This is pretty close to a one layer card! They can be so hard for me sometimes with this larger image made it easy! 1. Create a top folding card base. My base is 4 1/4 x 5 1/2. On the front for the base, cover the center with the heart stamp. I created a loose pattern. I used a few different colors of inks starting at the bottom with the darker colors and worked to the top using lighter colored inks. 2. 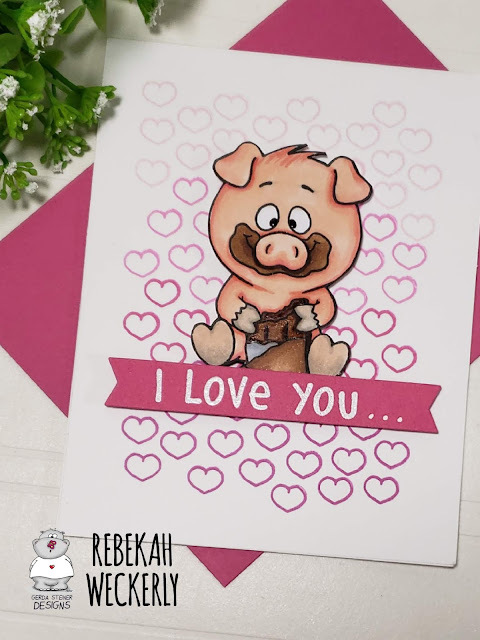 On a scrap of Copic safe paper I stamped the little piggie and colored him in with copic markers. Then I fussy cut him out and added foam tape behind him for a little dimension. 3. 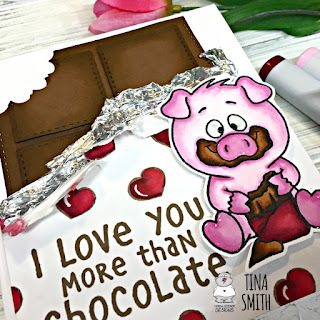 Then I stamped the sentiment on pink cardstock and heat embossed it with white embossing powder. Its as easy as that! 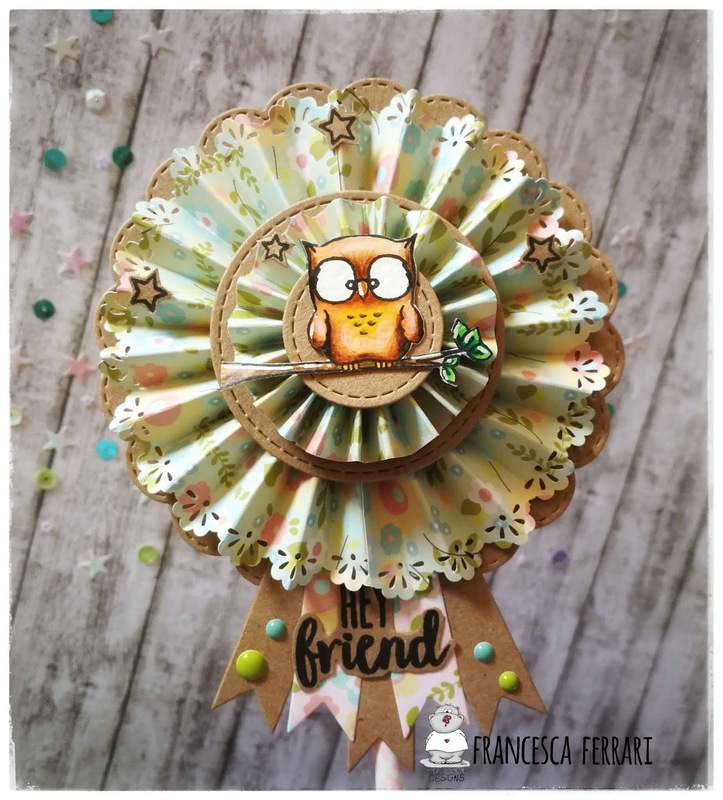 Super fun, cute and easy to make! Do you have this set yet? It can be yours - click here! 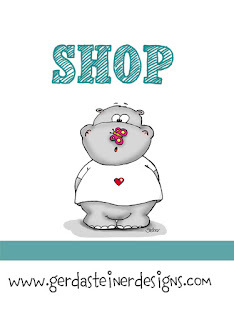 Happy shopping and coloring! 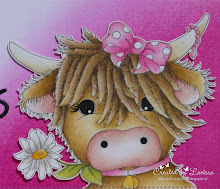 Goodmorning, I am Larissa from Car-d-elicious and today I am posting a card with a stamp from Gerda Steiner designs. This time I made a card with the digital stamp Umbrella mouse from Gerda Steiner designs. I have coloured the image with my Polychromos pencils and the black glaze pen. I have fussy cut the image. On a white card I glued a strip of orange design paper from the Country fair plaid paperpack from My favorite things (retired). On another piece of white cardstock I made a background with the help of the Rainy day stencil from Clearly besotted stamps and Tumbled glass and Broken china Distress oxide ink. I have die-cut a little hill from white cardstock with the Stitched basic edges from My favorite things. I have coloured the hill with Mowed lawn and Lucky clover Distress oxide ink. 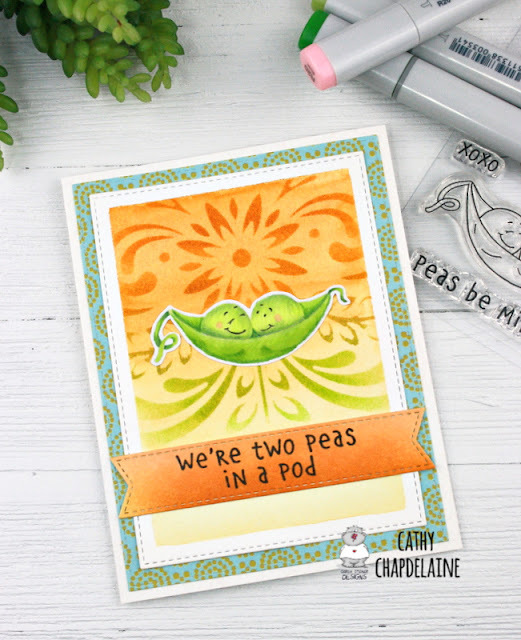 On the background I have stamped 2 sentiments from the stampset Hootie patootie from Lil inkers. With a black fineliner I doodled some lines on the background. I have glued the background with foamtape on the card and then I glued the image with foamtape on the card. Then I rounded the bottom corners of the card with the corner chomper. 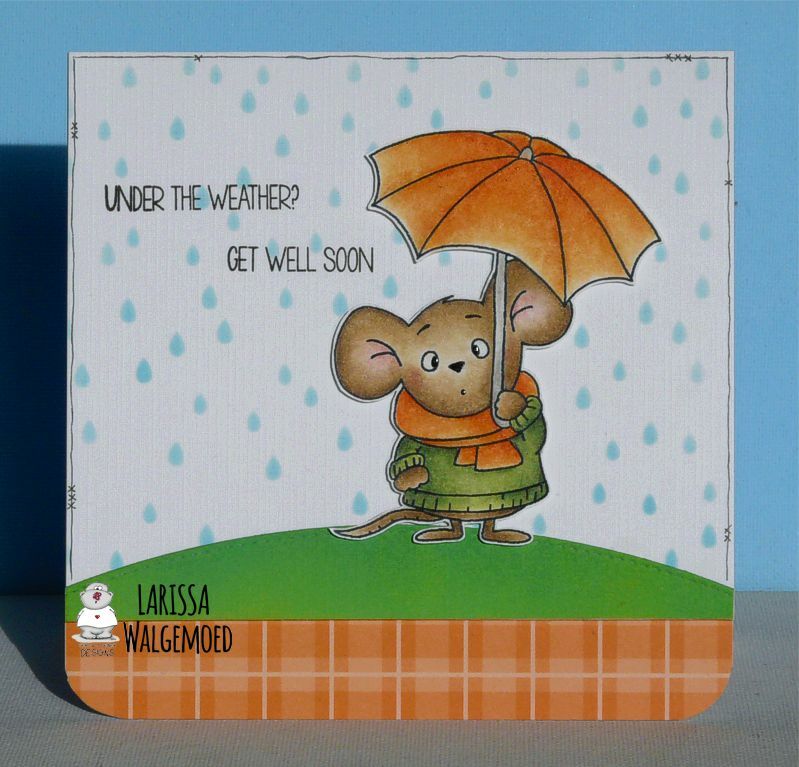 I created a card with the sweet new digital stamp Umbrella Mouse from Gerda Steiner Designs. I started with distressing the design paper. Then adhered it to a white cardstock card. Printed and colored the cute image, and cut it out with a Crealies stitched circle die. The sentiment is computer generated and after printing I cut it out with a cloud die and mat it on a blue cardstock die cut. 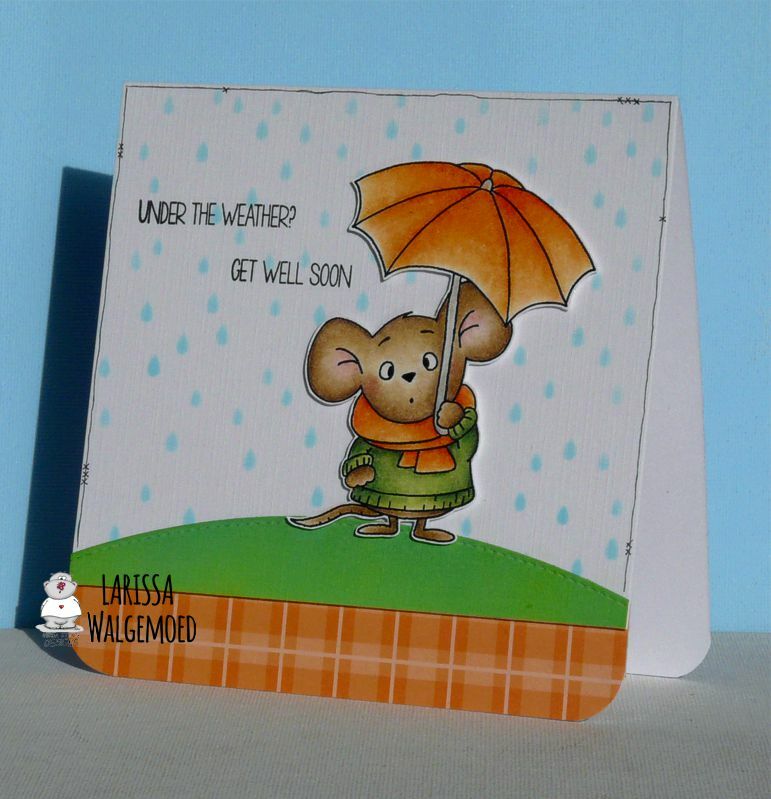 The raindrops are made with a part of Creatables LR0572 from Marianne Designs. Hope you like my card with this little mousey. Ik heet Margreet en ben al 45 jaar gelukkig getrouwd met Joop. We hebben 1 dochter, Femke en zij is getrouwd met Paul. Ik ben werkzaam geweest op het secretariaat van de afdeling Research van een diergeneesmiddelenbedrijf. Sinds september 2016 ben ik met pensioen. Ik ben helemaal gek van scrapkaarten maken. Waar ik ook ben, in Nederland of in het buitenland, ik loop altijd in winkeltjes te kijken naar kantjes, bandjes, knoopjes en andere dingetjes om op de kaarten te kunnen gebruiken! 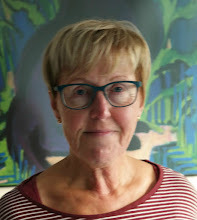 Ik hoop dat je het leuk vindt om op mijn blog rond te kijken en ik waardeer het als je een berichtje achterlaat! 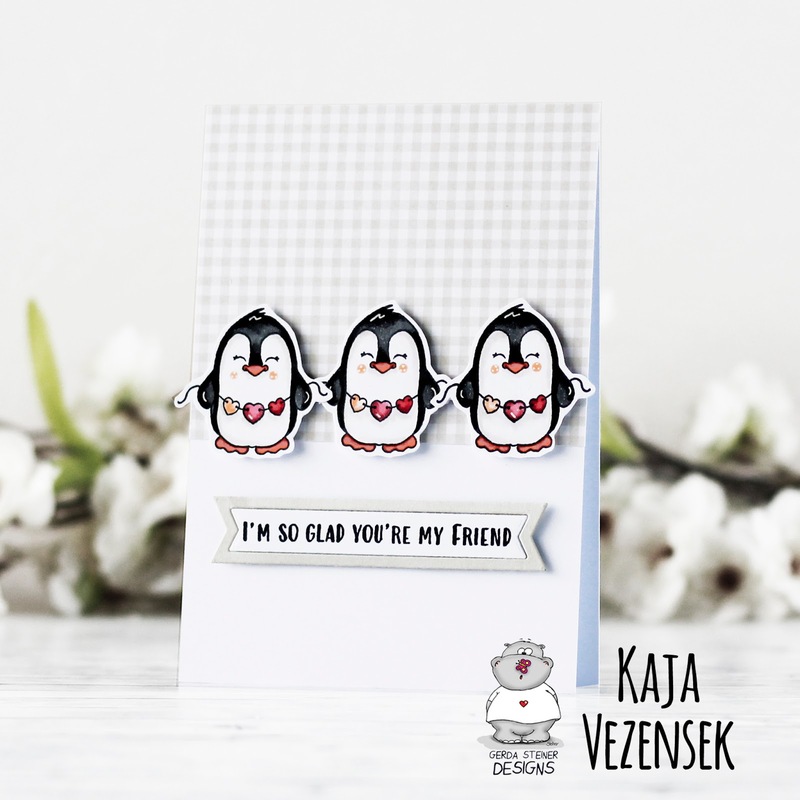 It's Kaja from Kajcyika crafts with you today with a cute friendship card! I decided to go with a simple design that has a valentine's day feel to it. I think it's important to remember letting our loved ones know how do we feel about them and that's the reason I made this friendship card. 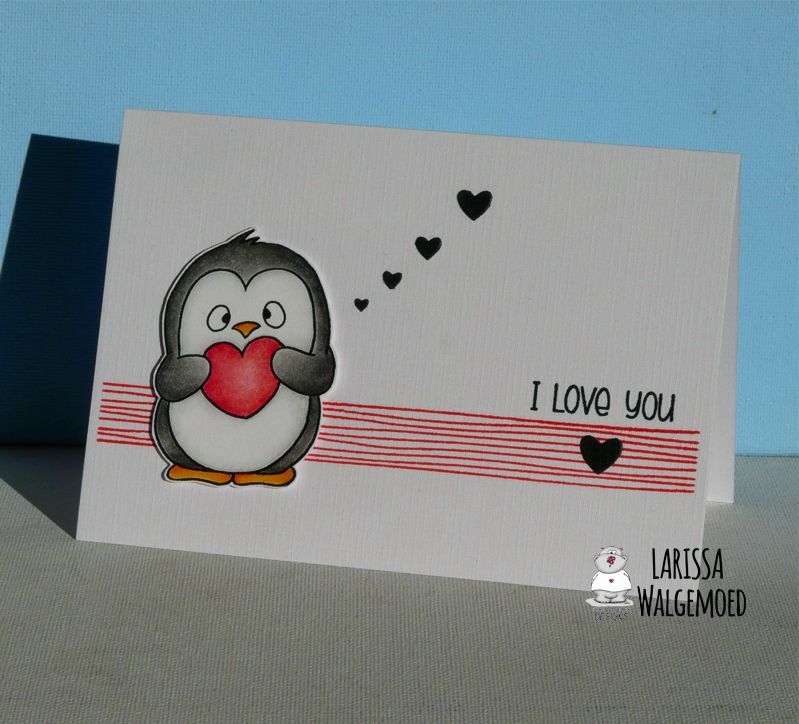 First, I stamped out the penguins from the Valentine penguins stamp set and colored them in using alcohol markers. I used pinks for the hearts and the black for their bodies. Then, I cut down a piece of gray patterned paper that I put on the top half of my card. I placed the three penguins on the edge of it. The last thing I added was a sentiment that reads 'I'm so glad you're my friend' which I put on a die cut banner. This finished of the card. Thank you so much for joining me! For today's card I have used the 'Panda in Love' digital stamp. The image has been printed onto Copic X-Press It blending card and coloured with Copic Markers. I have trimmed this card to 14 x 10cm. This is the base card. I have hand drawn a border around this base card using a Copic Mulitliner Pen. Cut the die sentiment twice and adhere on top of each other and adhere them to the base card. Colour some of the hearts with a glitter pen then apply Glossy Accents to those hearts. Hello friends! Karla back today with a cute Missing You card using the adorable new digital image 'Miss You Puppy' from the Gerda Steiner Designs shop. This little cutie could work equally well for a thank you, love you or pup-tastic birthday card, but I chose a miss you brush lettering sentiment stamp from my stash to add on top of the Pinkfresh Indigo Hills patterned paper, embossed with Emerald Creek Magical Mysteries Embossing Powder in Dragon's Egg. The subtle striped heart is diecut with a MFT die, which I used inside a stitched circle and layered over a pretty white doily. It was easy to give this little guy a pretty patterned bed by simply printing out an extra digi stamp on another piece of white copy paper and then gluing the purple patterned paper directly on top of the image. I then ran the whole page through the printer again and fussy cut out around the bed before gluing it down to the image printed on cardstock. I coloured this guy in with Copics and Prismacolor Markers and shaded the patterned paper to give a bit of depth. A white gel pen adds some highlights, and I added some Paige Evans stickers and Maya Road twine for embellishments. 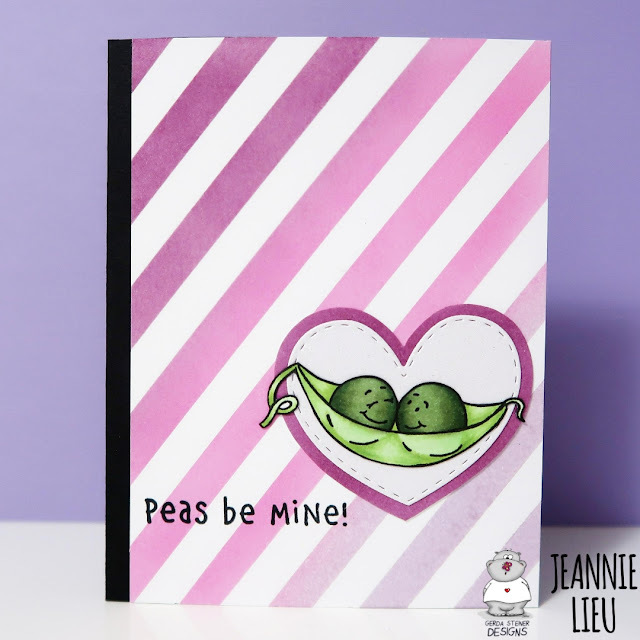 Inside, I stamped a heartfelt sentiment on my kraft cardstock base with Distress Oxide Inks. I just love how they show up on darker cardstocks! Thanks so much for stopping by today! I hope you have a fantastic weekend and a wonderful week ahead 💜 Be sure to head over to the Gerda Steiner Designs Shop to see what inspires you to create today! Happy Saturday! 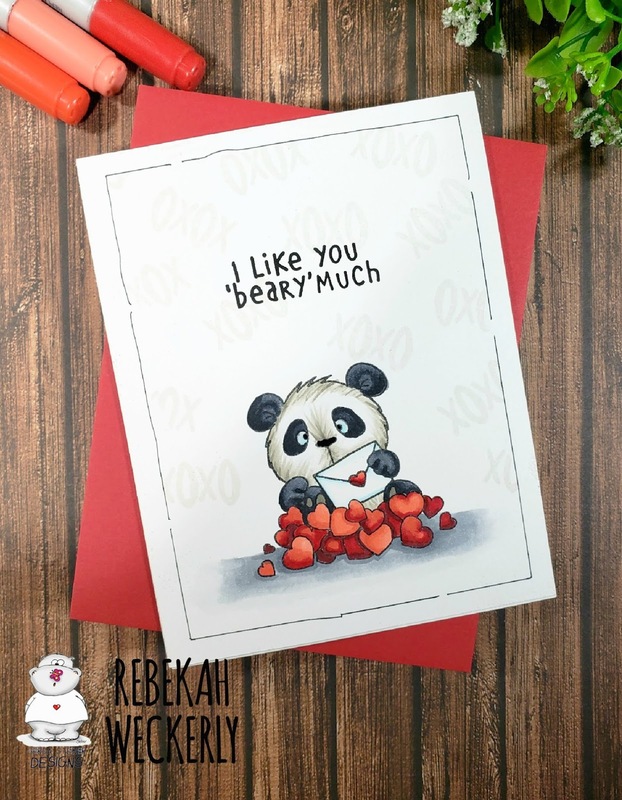 It's Rebekah here, bringing you a one layer, easy Valentine's Day Card! 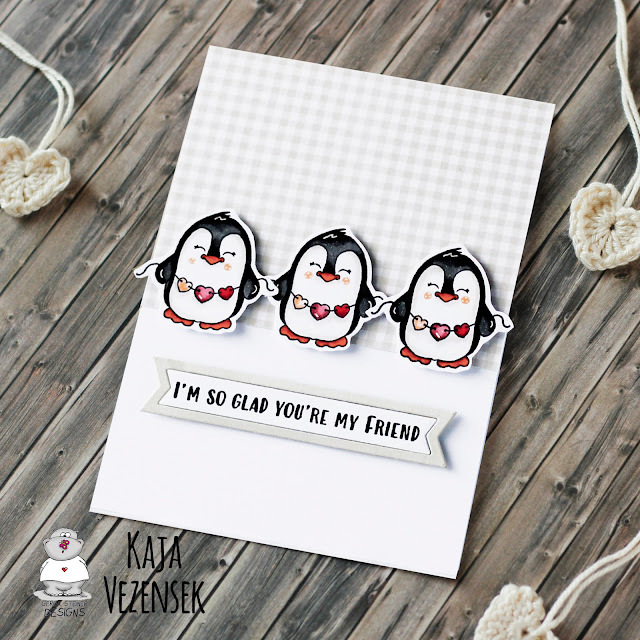 I was so excited to see this week that the Lovely Pandas stamp set was back in stock at the Gerda Steiner store! It's easy to see why this set has been so popular. These images are simply adorable and so fun to color! 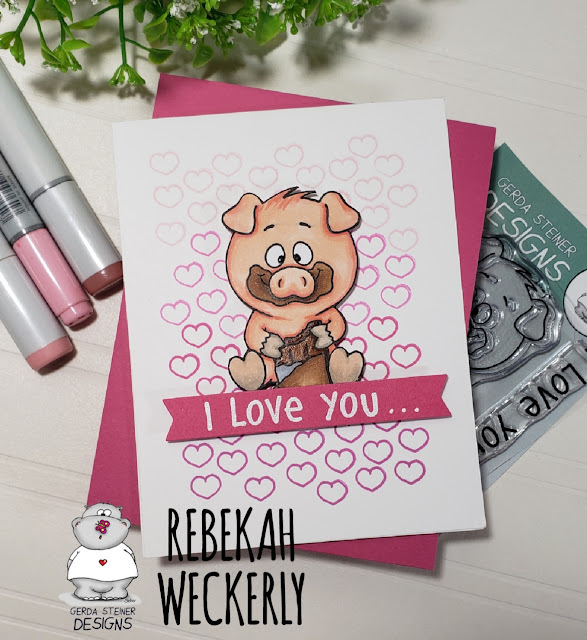 This is a one layer, quick and easy Valentine's Day card that would be perfect to give to your significant other, a child or even a friend. There is a little masking involved but really the process is simple! Step 1. 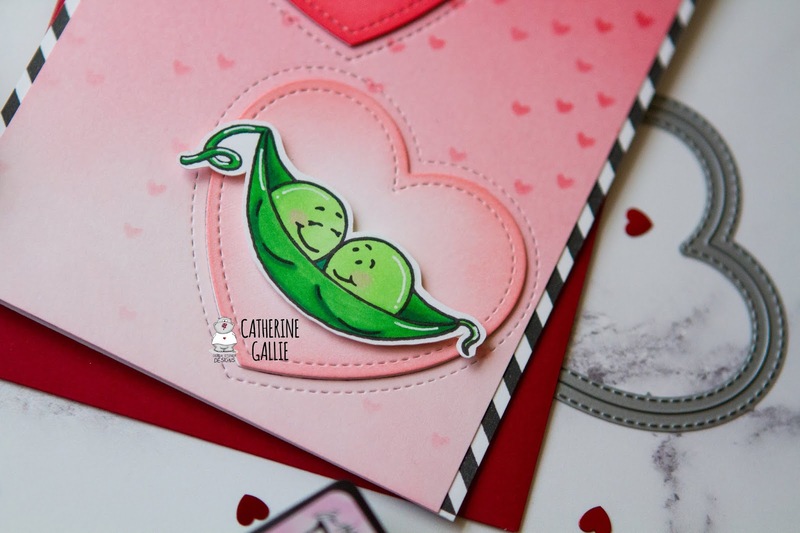 On a 4 1/4 x 5 1/2 folded card base, stamp the hearts image towards the bottom of the card. Stamp the hearts again on masking paper and fussy cut. Step 2. 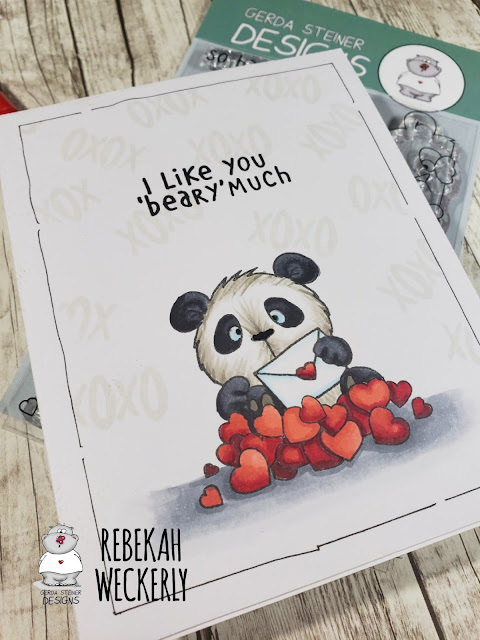 Place the hearts mask over the hearts on the card base then stamp the panda. Remove the mask and color the images with your whichever color medium you would like! I used Copic markers. Step 3. 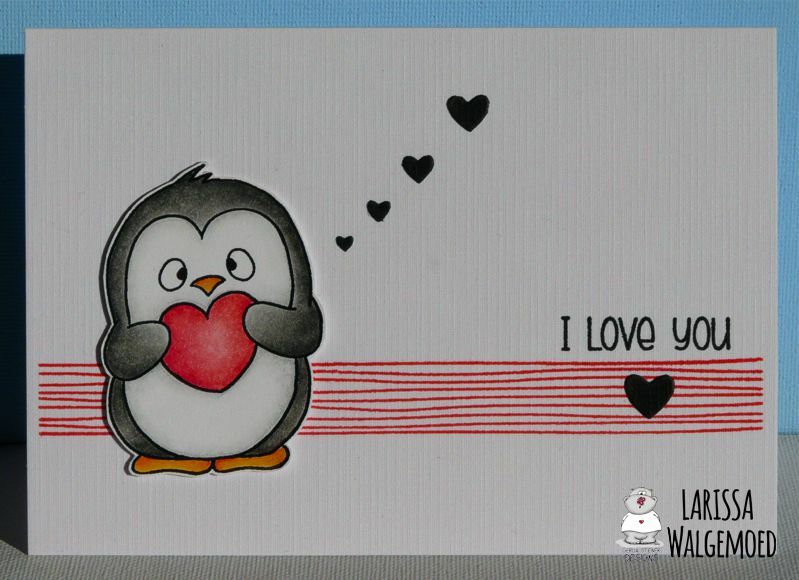 Mask off 1/4 inch around the edge of the card then using a light gray ink, stamp the 'XOXO' sentiment randomly. Get close to but don't stamp over your panda! Stamps sentiment in black ink. Step 4. 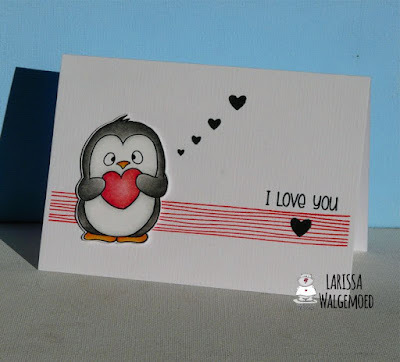 Use a fine a fine tip marker to draw a loose frame around the edge of the card. I did not try to get this straight at all. The fact that the line is not perfect adds to the whimsical feel of the images! One of the best things about this card is that is is flat - perfect for mailing! Be sure to visit the Gerda Steiner shop and get this set before its gone...AGAIN! Today I'm sharing a Valentine's Day card I made using the gorgeous new stamp set called Peas be Mine. 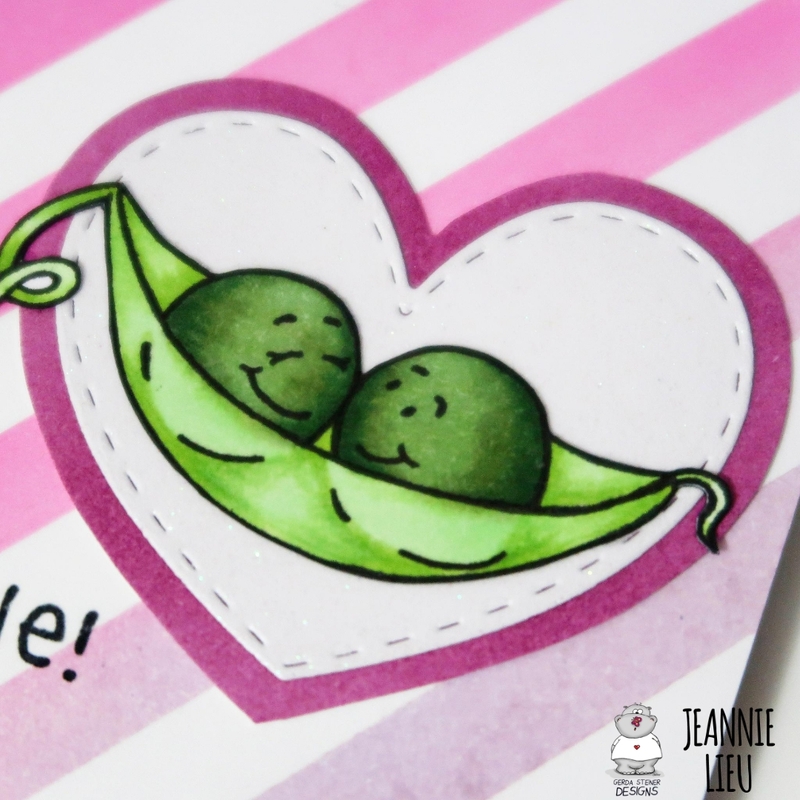 To start off, I stamped and coloured the adorable peas in their pod image using copic markers. 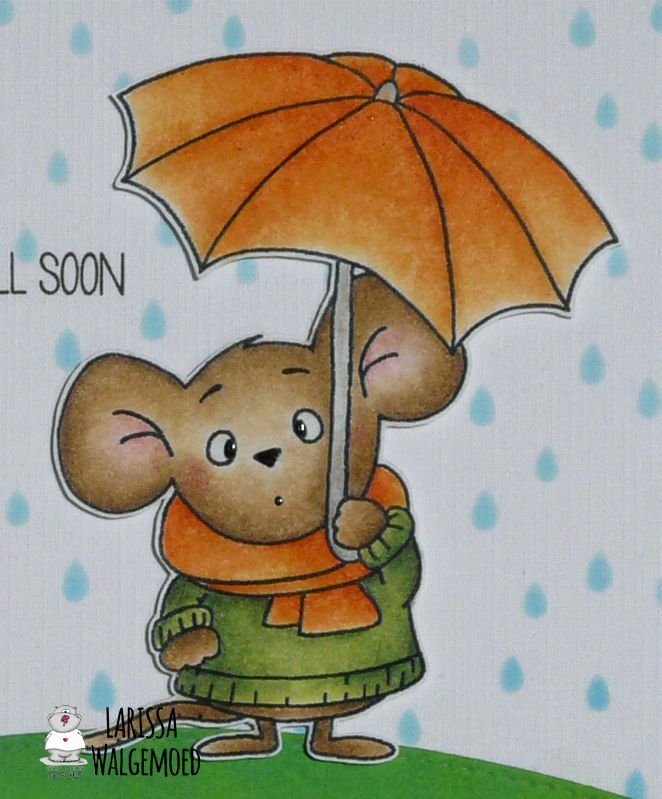 I then cut it out using my scan n cut and set it aside to create the rest of the card. 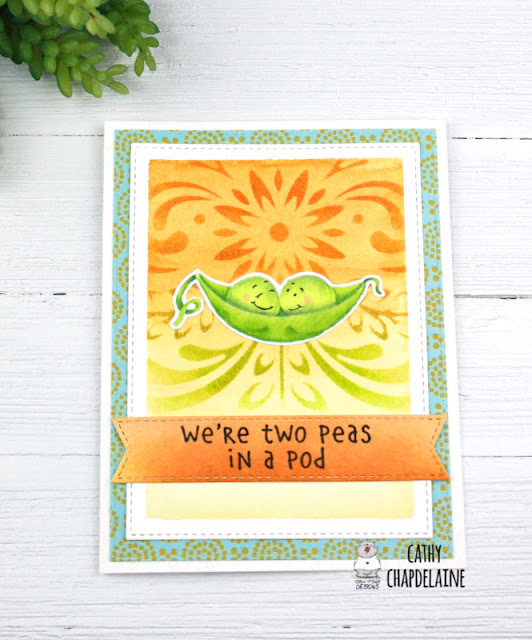 Using distress inks I ink blended the background to achieve a gradient look. I then decided to apply a small falling hearts stencil and ink blend some more to add the tiny hearts on the background. Next, I die cut the 2 stitched hearts from this background and set those hearts aside and cut some more hearts out of white cardstock and ink blended those hearts separately. 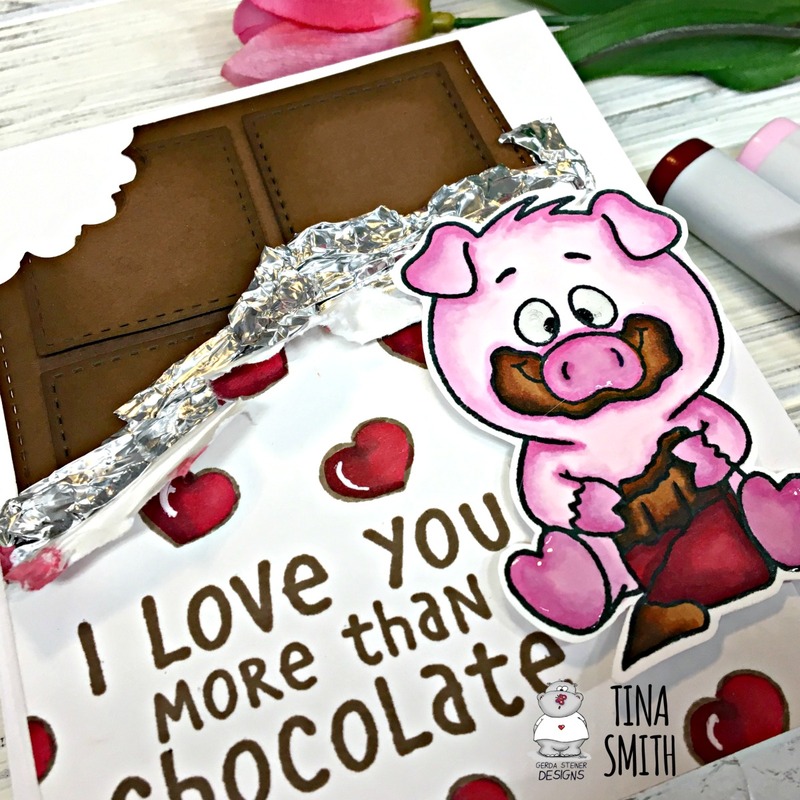 I stamped the sentiment onto the darker heart and heat embossed it using clear embossing powder over the top. I die cut the hearts three more times using white card stock and glued and stacked the heart pieces together for dimension. I stamped a piece of A2 white card using a diagonal stripe background stamp so that I could have a small strip down each side. I trimmed the pink ombre panel so that it was slightly smaller than the diagonal panel. Now it was time to assemble the card. First I adhered the diagonal stripe piece to the card base and then adhered the pink panel on top of that and inlaid the stacked hearts into the die cut pieces. 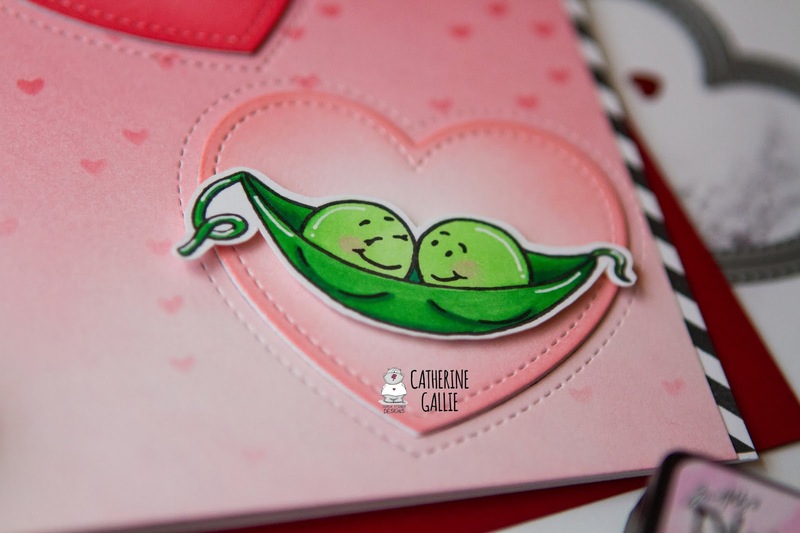 I adhered the pea image to the bottom heart using foam tape for even more dimension. I stamped the sentiment inside the card and added a stamped image of the peas in the pod and some hearts. This completes the card for today, I hope you like it. I will be back next week with another cute pea card. Happy New Year everyone! I can't believe it's already 2019 and it's exciting because new stamp sets are going to be released. One of the newer ones from Gerda Steiner is this one I'm using today, On The Table. As always, it's an ADORABLE set. I love peeking animals and Gerda does them so well. This one is no exception. I created a scene for this stamp set where the doggie and kitty are peering on the table because there are some milk and cookies. I added a window for interest and used a stencil for the wall so the background wasn't just one color. Additionally, I added interest to the table by drawing in woodgrain. Otherwise, I think the table and the background would be a bit boring. I love how this card turned out and I think the stamp images in this set are perfect for creating a cute scene. 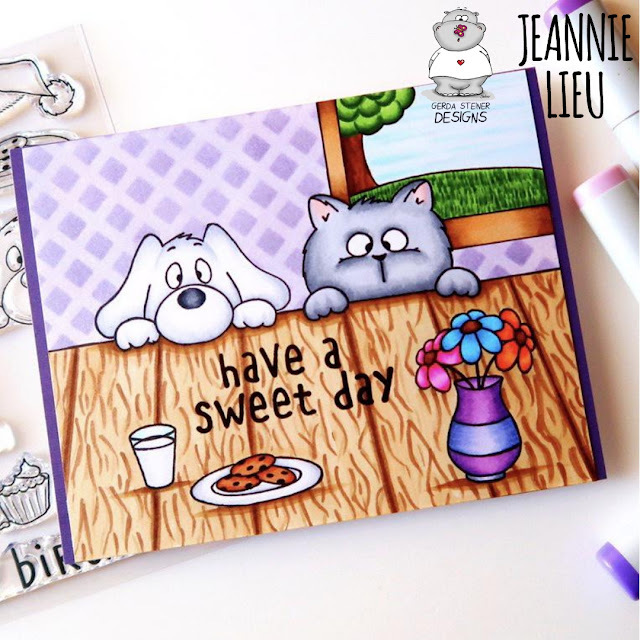 Thanks for stopping by to take a peek and hope it inspires you to create your own scene using these stamps. Labels: Jeannie Lieu, On The Table? I created a lollipop card featuring the super cute owl from the "FOXES" clear stamp set. 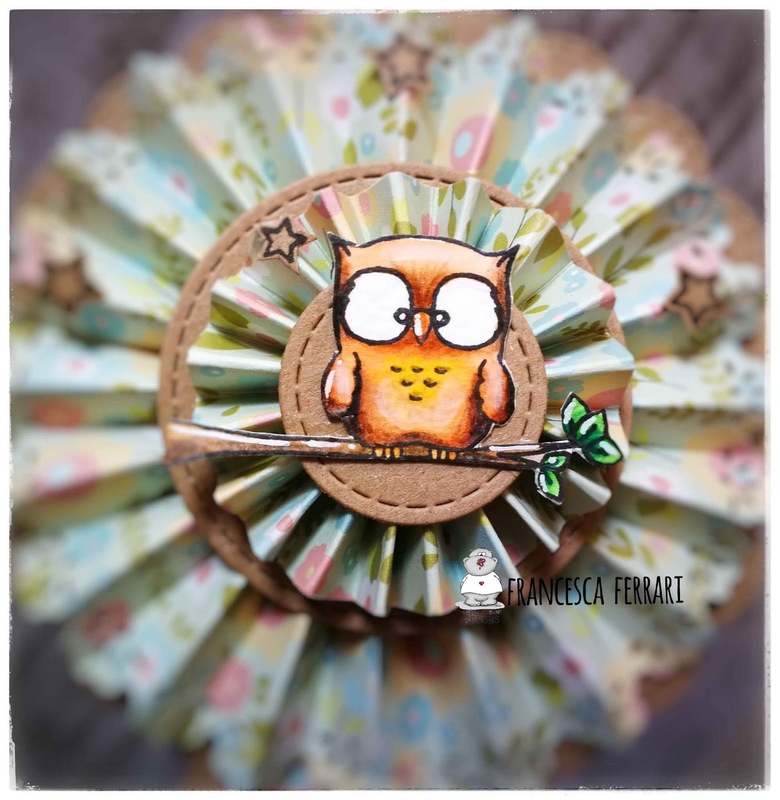 The owl is the main character of my card... I immediately fell in love with it! I colored the stamp with Zig clean color real brush and colored pencils. The details were made with white gel pen. 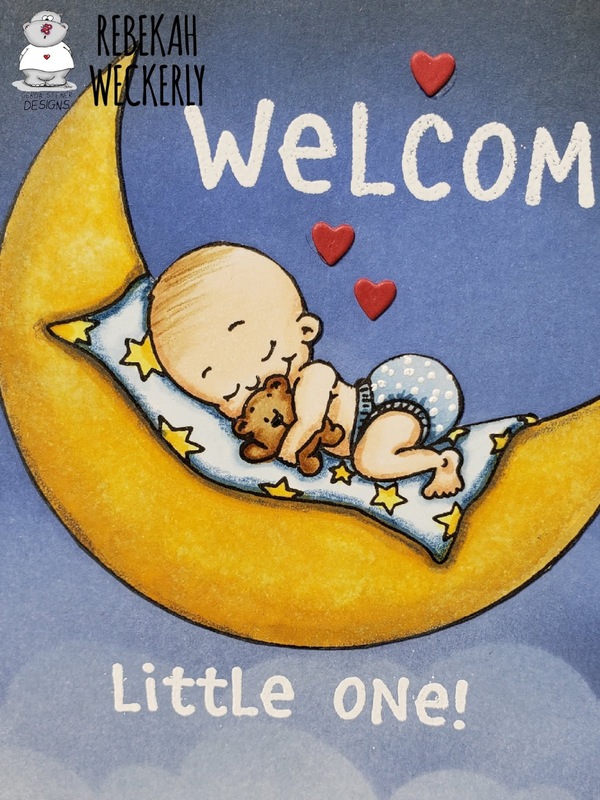 I embellished my card with the stars of the stamp set, little banners and enamel dots. 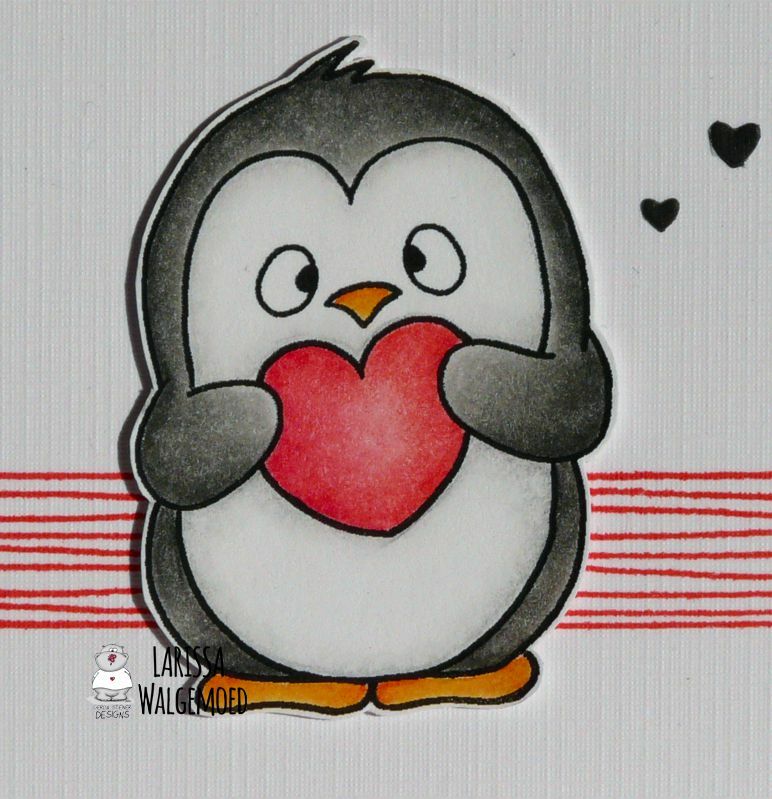 This time I have made a card with the digital stamp Penguin with heart from Gerda Steiner designs. I have coloured the image with my Polychromos pencils and then I have fussy cut the image. I have stamped the stripes from the set Cozy plaid stamps from Lil inkers with Tulip red ink from Versafine clair. 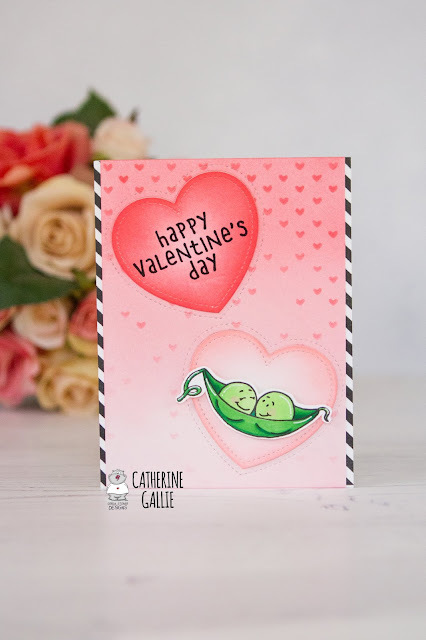 I have stamped a sentiment from the set XOXO sentiments from CC designs with Nocturne ink from Versafine clair. From black cardstock I have die-cut a couple of hearts with the Confetti creative cuts from Mama elephant and I decorated my card with those. 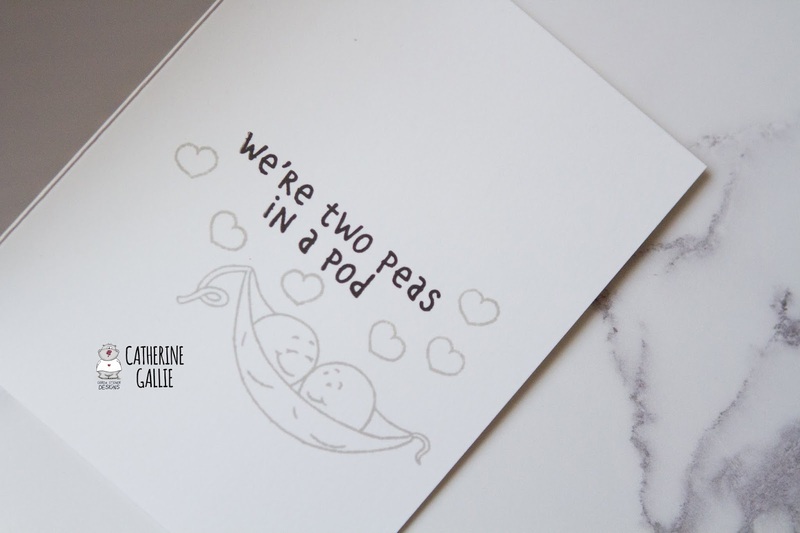 It's Ashlee here today with a new card to share with you!! This set is such a fun one to create space themed cards, perfect for male birthdays and greetings!! 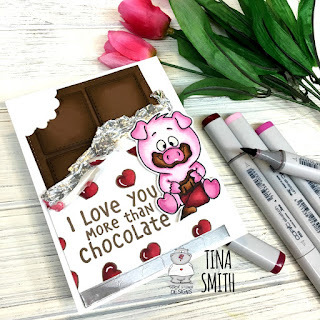 To create this card I used some galaxy designer paper and then cut out some clouds using a cloud border die with white cardstock and vellum. I coloured and cut two of the cute little aliens, the awesome little astronaut and the flag then added them onto the card base with some foam tape for added dimension. A touch of pretty sequins to add some bling finished off the card. I used a cloud stencil and Distress Inks to create the background. I added my image placing it at a slight angle to make it look like this sweet baby just drifted onto the moon. I then stamped the sentiments with Versamark ink and embossed it using white embossing powder. I also added a few small hearts for a pop of color and a little more sweetness! I love the blue night sky on this card but I think it would look amazing in pink, too! Be sure to share with us what you make using Gerda Steiner Designs stamps! We love to see your creations! 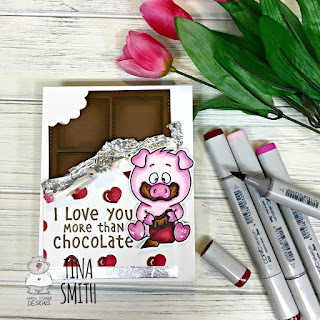 Creating a Chocolate bar is super easy too, just use brown cardstock and Walnut Stain Distress Ink:) You can watch the tutorial on how I created this card down below. Thanks so much for stopping by! Wishing you a fabulous and delicious day! 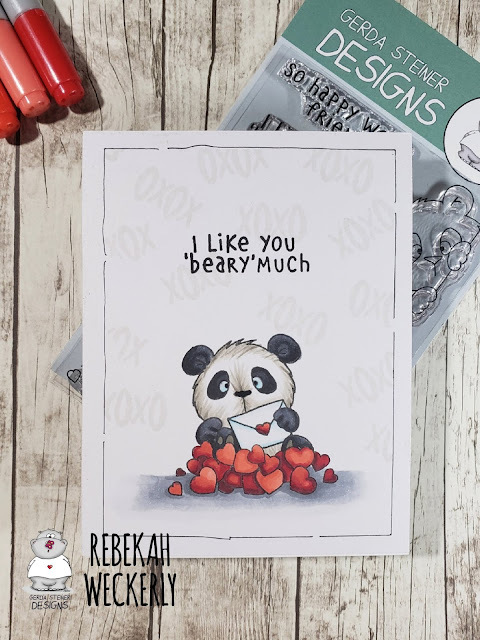 Hugs and Happy Crafting! Hi everyone! It's Jeannie and I'm back to share another card with you today that's perfect for Valentine's Day or any occasion to let someone know you love them. 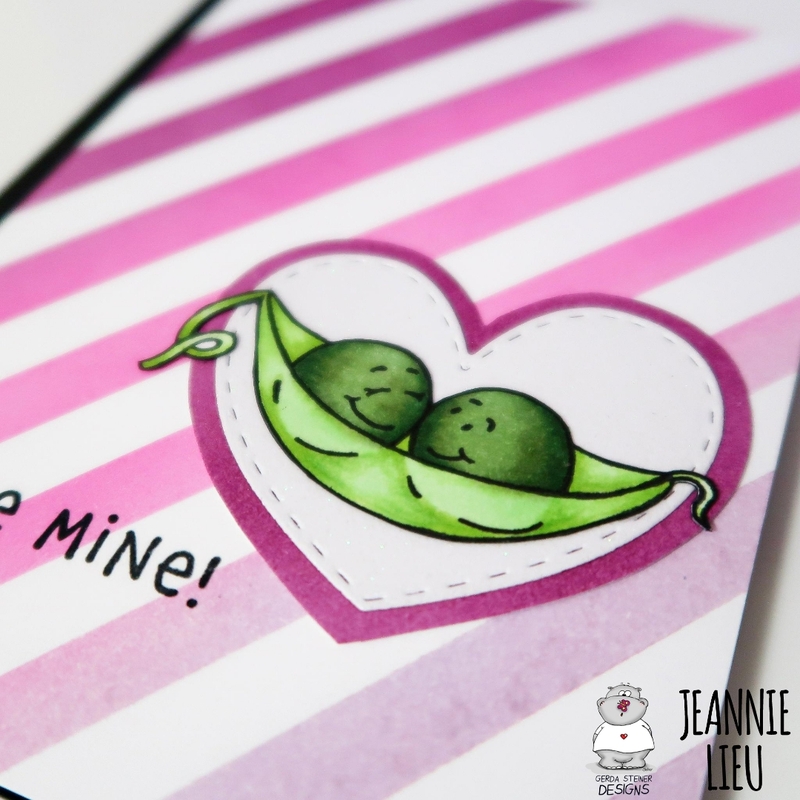 I'm using the new set called Peas Be Mine. It's a small set but it's perfect for a simple card. I added this sweet image instead a glittery heart so the eye will focus on this portion of the card. Since the image is super simple, I wanted to create a fun background. I did so by masking off stripes and used three distress inks to create this purple ombre look. I know the conventional colors for Halloween is pink and red, but I decided purple will work perfectly for this as well. 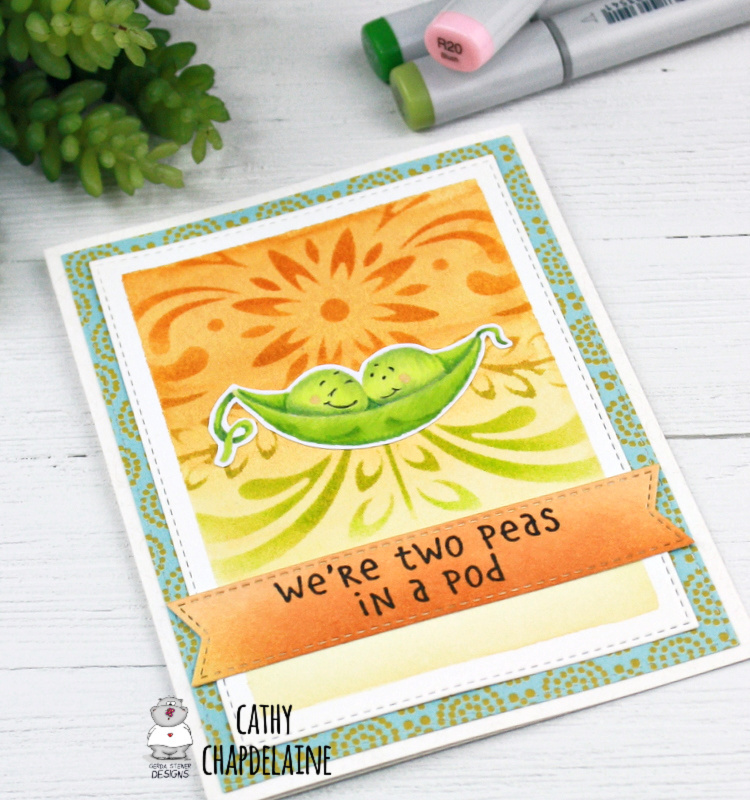 I just love how this card turned out because the focus of the card ultimately draws the eye to the pop of green from the image. It's so adorable! 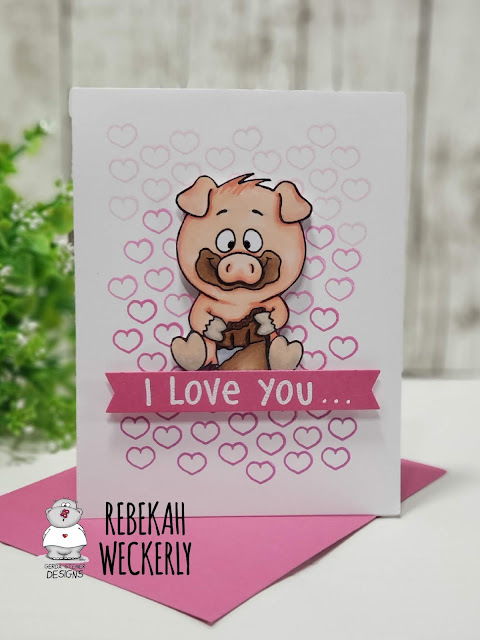 To finish this card off, I trimmed down the striped background by .25" and popped it on a black card base so it peeks out on the side. I added the sentiment "Peas Be Mine" on the left side of the image. I decided to keep it really simple. Thanks for stopping by and I hope you enjoyed the card. 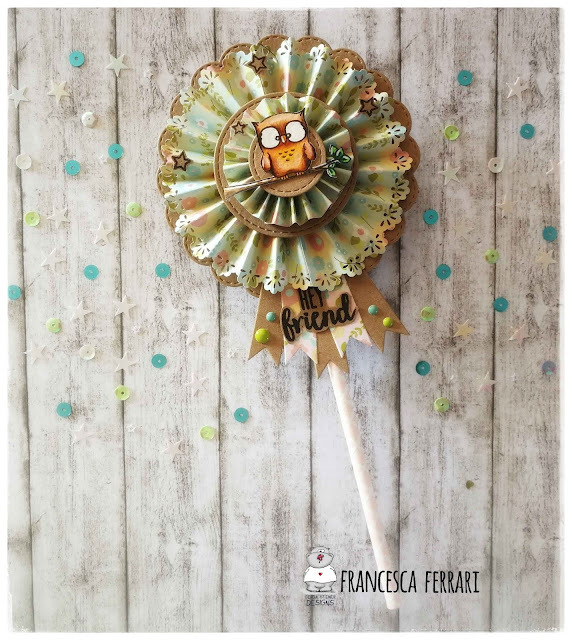 I used the ticket die from Studio Light and some lovely papers from Joy!crafts. The hearts are die cut with Nestabilities. I downloaded the digistamp in Word. Put 3 of the penguins side by side and resized 2 of them to merge. Colouring was done with copics. I worked on the hearts with Stickles. I had some fun with watercolor, stenciling and inks to create a happy background for them. I started by die-cutting a piece of watercolor cardstock and taping off 1/4" on all sides. I then did a wash of Daniel Smith Quinacridone Gold starting from the top and watering down the color towards the bottom to create a nice gradient. I used a Hero Arts stencil and distress inks in Wild Honey, Fossilized Amber, Crushed Olive and Twisted Citron. I colored the peas with Copics and fussy cut around them leaving that thin white border to help them stand out on the background. I die-cut a banner and inked it with Wild Honey and Rusty Hinge distress inks and stamped the sentiment from this set. The patterned paper is from my stash. I love it when I find a random paper that just works. 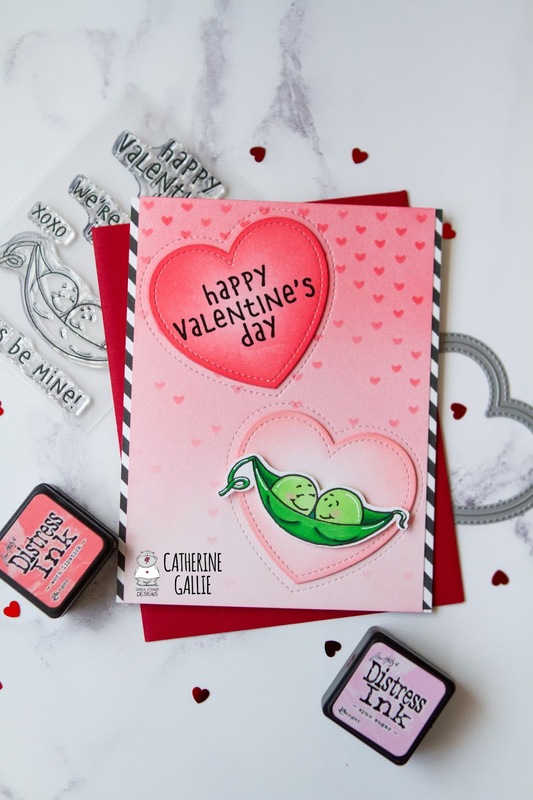 This stamp set also comes with a Valentine's sentiment, but it's perfect for everyday love cards too.